Every year for my daughter’s birthday I make her special birthday pancakes for breakfast. Over the years I’ve made Cake Batter Pancakes, Double Stuff Oreo Pancakes, and Peanut Butter Cup Pancakes. 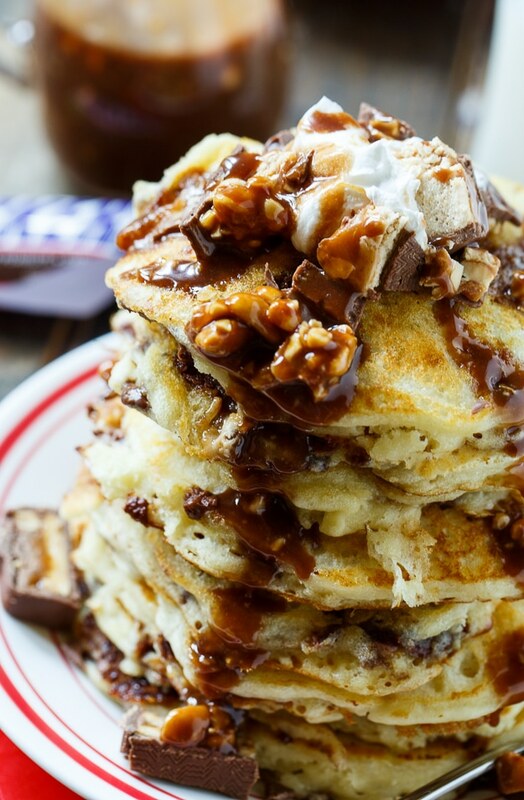 This year she requested Snickers Pancakes. I think she got a little hooked on Snickers bars after I bought a bunch to make Snickers Caramel Apple Salad. Ordinarily I only buy them for Halloween. As a base I started with my favorite pancake batter recipe but reduced the sugar some. I added chopped up Snickers bars to the batter. Plus I thought it would taste more breakfasty that way. And it was a huge hit with the birthday girl who I can’t believe is now 16. She’s almost grown but I’m hoping she’ll want birthday pancakes for many, many more years. 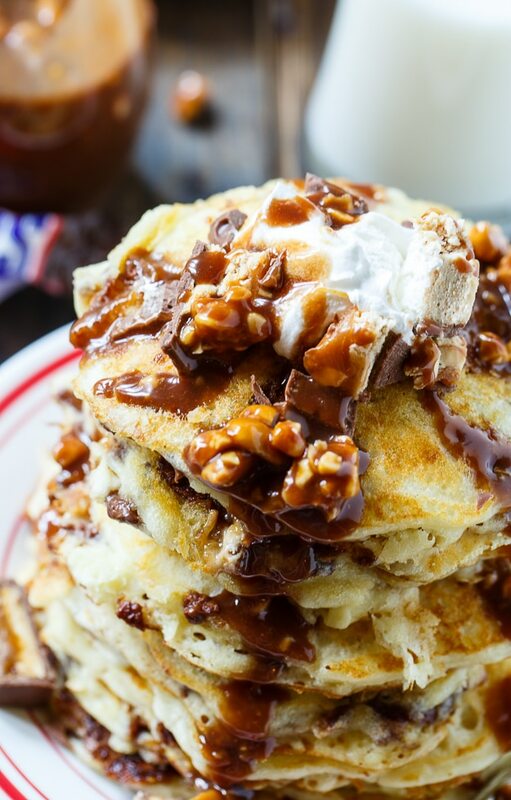 Snickers Pancakes with Snickers Syrup make a truly special breakfast. 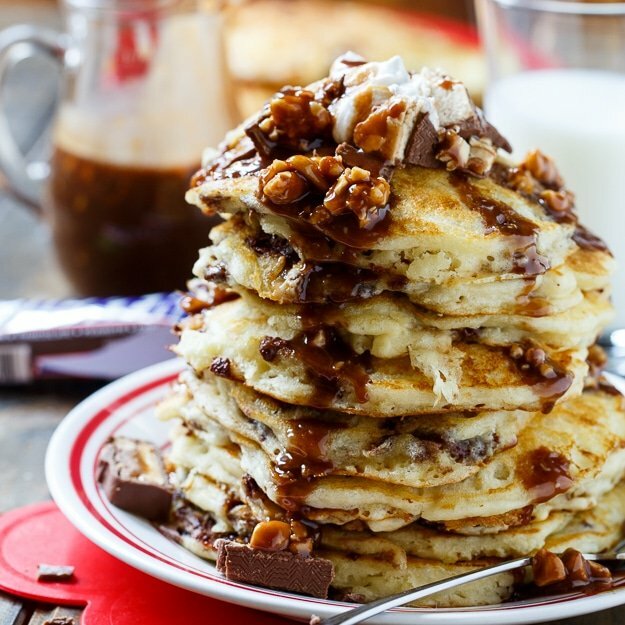 Chopped candy bars are added to the batter and melted to make a syrup. Whisk the egg into the buttermilk and add to flour mixture along with melted butter. Stir with a wooden spoon just long enough to get flour mixed in. Fold in 2 chopped snickers bars. Grease a griddle or large nonstick pan with vegetable oil and heat over medium heat. Use a ladle or measuring cup to pour batter and form pancakes about 4 inches across. Batter will be thick. Cook until bubbles form on top, flip over and cook until set in the middle. 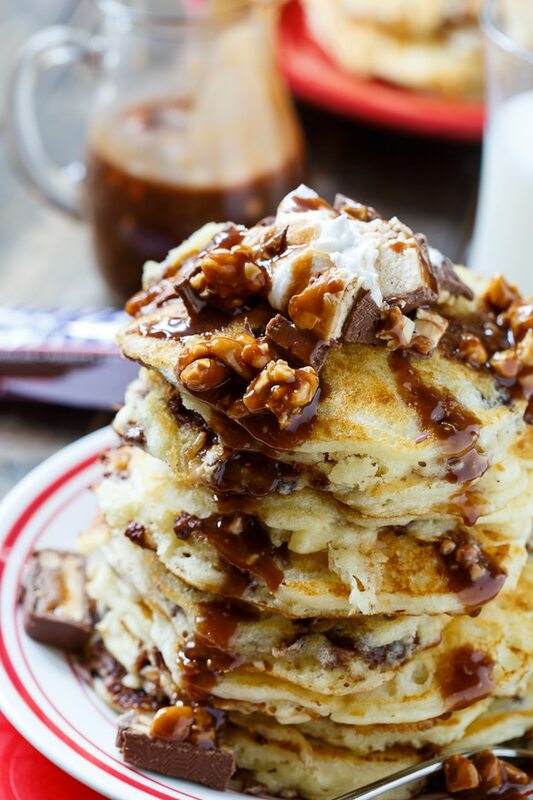 To make syrup, place 3 chopped Snickers bars and heavy cream in a small saucepan with a heavy bottom. Set over low heat and stir until completely melted. 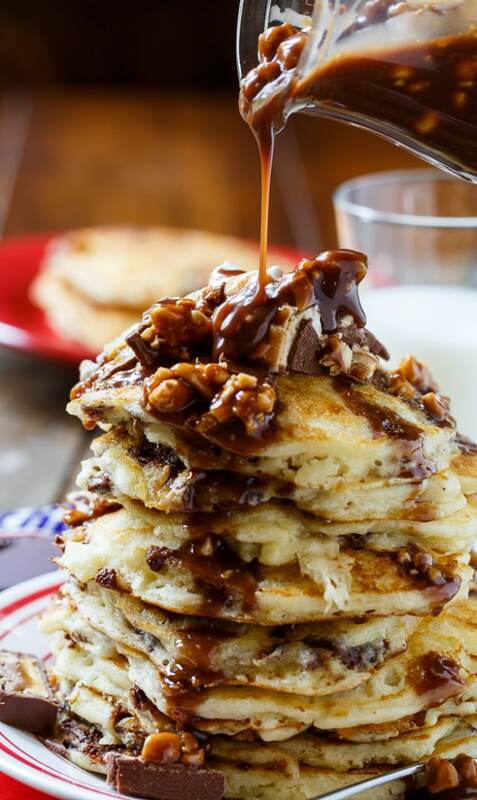 Stir in maple syrup. You can reheat the sauce in the microwave if you need to. This entry was posted in Breakfast, Meal and tagged chocolate, pancakes. Bookmark the permalink. These look fantastic! I have a question, though. What size Snickers bars did you use? Thanks. Sorry! I meant to put the size in ounces of the bars but forgot. I used the regular-sized ones. I think they are around 2 ounces each. Thank you. I see some delicious pancakes in my future! 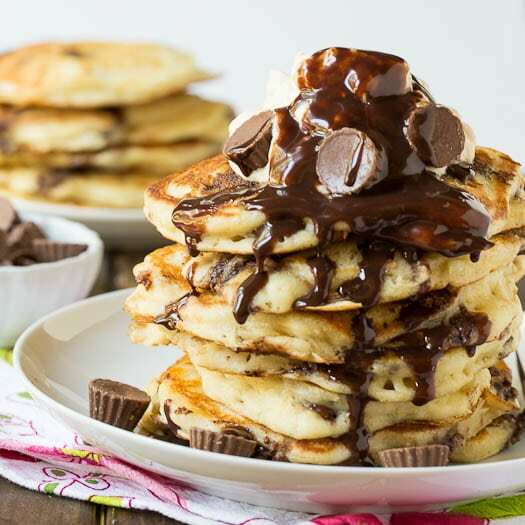 These pancakes look so decadent. You have got to be kidding! These pancakes are OUT OF THIS WORLD Christin! I am in LOVE! Absolutely gorgeous!! Happy happy birthday to your daughter! 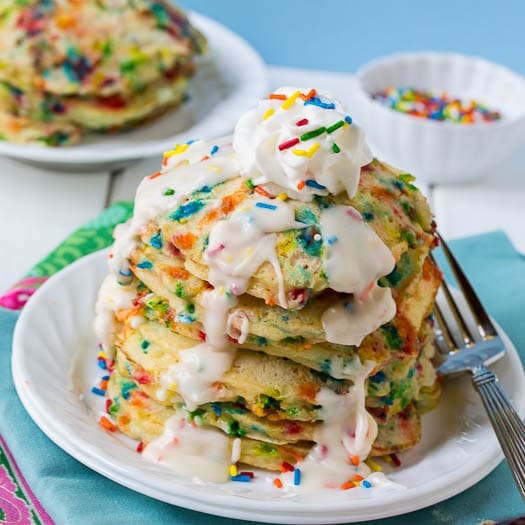 The birthday pancakes you make every year are always so much fun and leave me drooling! Love these snickers ones, they look amazing! 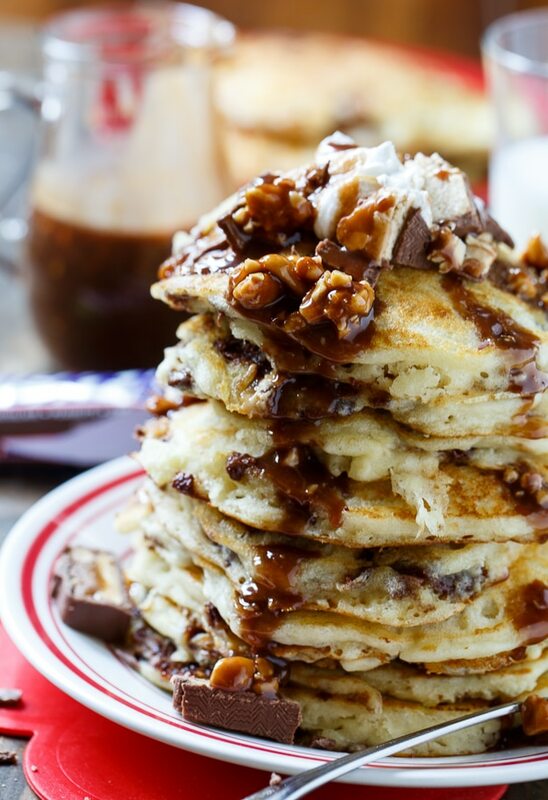 Snickers pancakes?!?! Oh my goodness those look positively amazing! 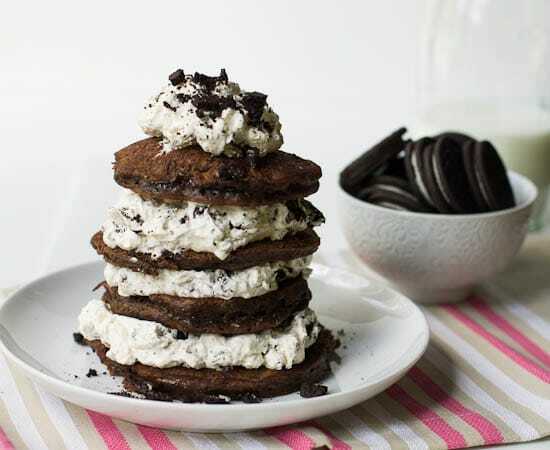 I want to eat that whole stack! Now that is my kind of breakfast! Definitely perfect for a decadent birthday treat 🙂 Love the snickers syrup too! Holy moly do these look good, Christin! Love the snickers in these babies! What a delicious pancake!